If you ever wondered whether the health insurance crisis in the United States was really something to worry about, this new study will give you pause. A randomized poll of thousands of Americans revealed that almost half had no insurance or inadequate insurance for at least part of last year. In 2012, nearly half (46%) of U.S. adults ages 19 to 64, an estimated 84 million people, did not have insurance for the full year or had coverage that provided inadequate protection from health care costs (see chart). 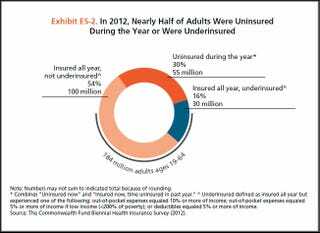 Thirty percent, or 55 million people, were uninsured at the time of the survey or were insured but had spent some time uninsured in the past year. An additional 16 percent, or 30 million people, were insured but had such high out-of-pocket medical costs relative to their income that they could be considered underinsured. The number of adults who had gaps in their coverage or were underinsured climbed steadily over the past decade, rising from 61 million in 2003 to 81 million in 2010, or from 36 percent of working-age adults to 44 percent. Being "underinsured" means that the person has health care coverage where the out-of-pocket expenses in 2012 were so high that it was equivalent to being uninsured. Of the estimated 55 million adults who had a gap in coverage in 2012, 87 percent had incomes that would make them eligible for subsidized health insurance under the law. Twenty-eight million had incomes below 133 percent of the poverty level, making them eligible for Medicaid, and 20 million had incomes between 133 percent and 399 percent of poverty, making them eligible for subsidized health plans. In addition, of the 30 million adults who were underinsured in 2012, 85 percent had incomes that could make them eligible for Medicaid or subsidized health plans, with reduced out-of-pocket spending. More people insured and better-quality coverage will likely lead to less medical cost–fueled debt and fewer cost-related access problems. Still, they argue, this is only an interim solution. Read the full study on the Commonwealth Fund site.